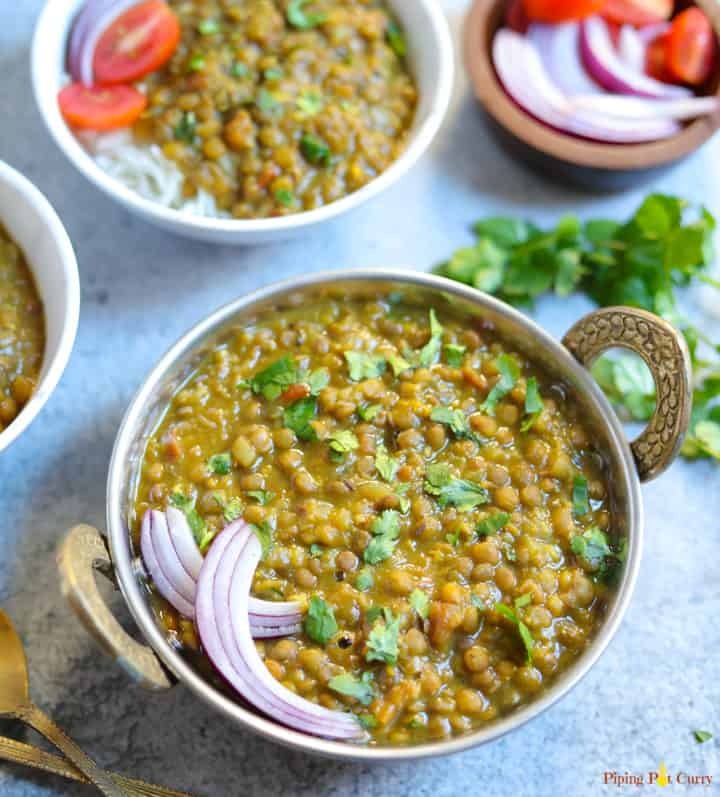 Enjoy this delicious & healthy Whole Masoor Dal, also known as Brown Lentils Curry, made in the Instant Pot or Stovetop Pressure Cooker. Vegan & Gluten Free. Whole Masoor Dal is also popularly known as Brown Lentils or Sabut Masoor ki Dal. These are basically whole red lentils which are popular all over the world. We make this Whole Masoor Dal very often for dinner. It goes perfectly with rice, naan or roti/paratha. 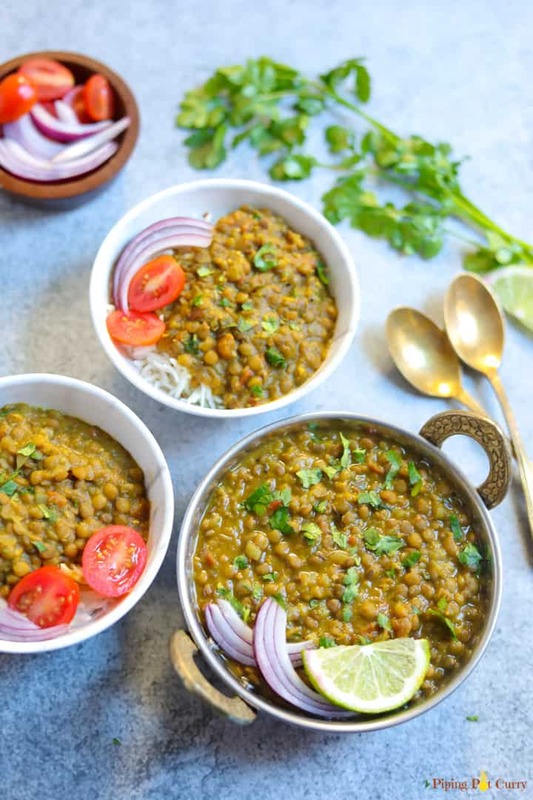 This dal can be made in the instant pot or a stovetop pressure cooker. 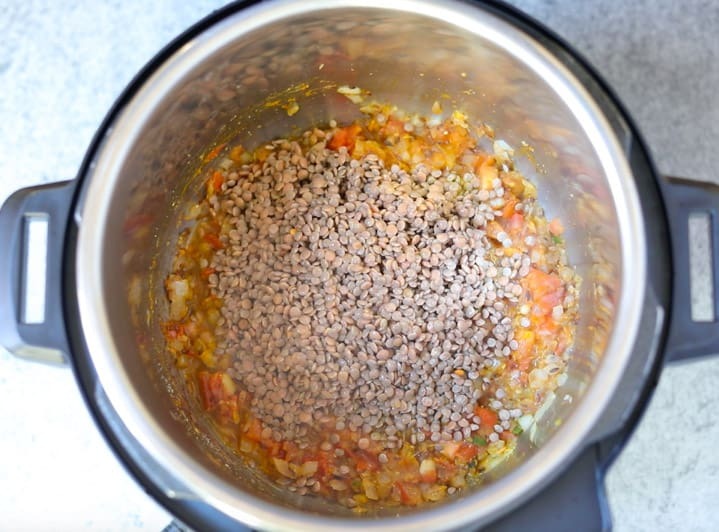 I love the convenience of making lentils in a pressure cooker, as they cook so quickly and are almost hands free. If you are new to the instant pot, check out this quick setup guide. Lentils, also known as Dal or Dhal are a mini legumes. They are a good source of protein, fiber and minerals. There are many varieties of lentils such as yellow (moong and toor), green (moong), red (masoor), brown (whole masoor) and black (urad) lentils. These lentils are a rich source of dietary fiber and 11 grams of protein. They contain nine essential amino acids, which makes them a popular source of protein for a plant based diet. Brown lentils hold their shape well while cooking. After cooking, brown lentils have a wonderful creamy texture. Brown lentils are also easy to cook and make a great main dish such as a curry, stews or soup. 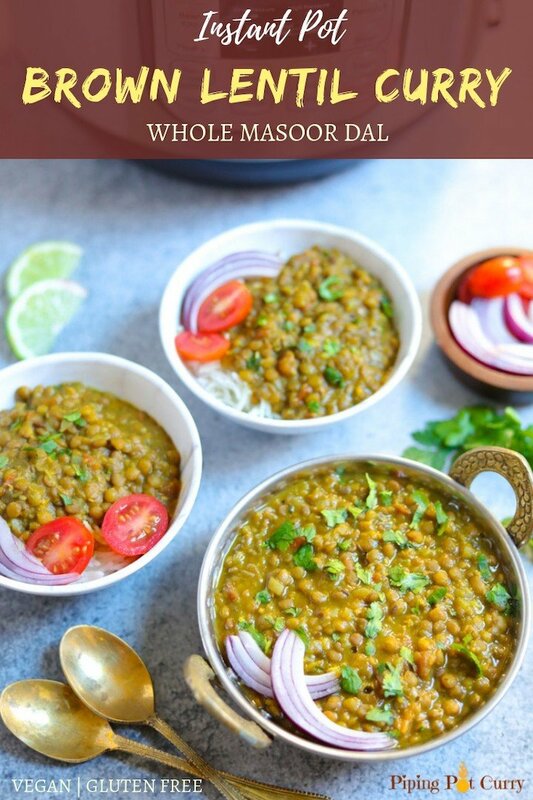 How to make Whole Masoor Dal in Instant Pot? Let’s start with gathering the ingredients. 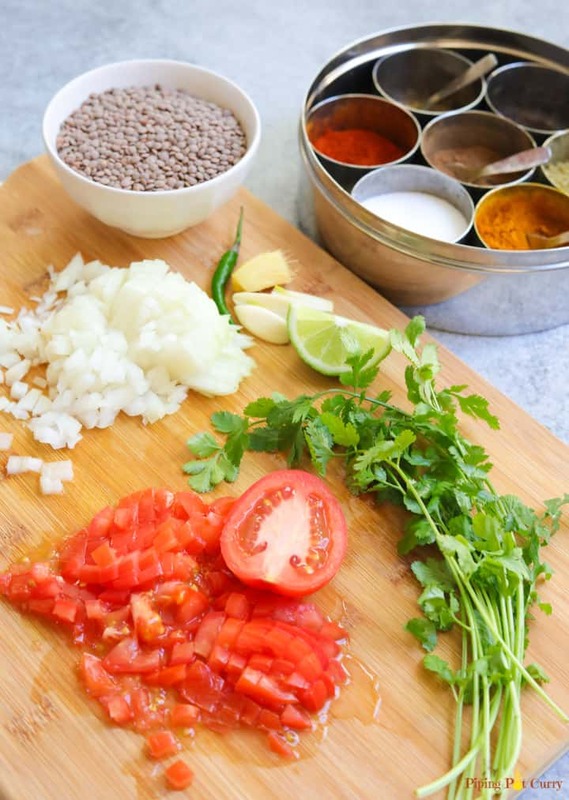 I use brown lentils, onions, tomatoes, ginger, garlic, green chili pepper and spices to make the dal. Rinse the brown lentils in water and chop the ingredients. 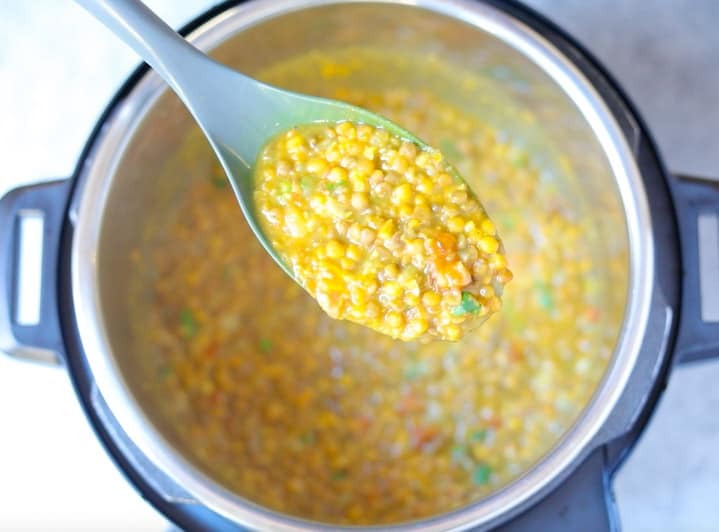 You do not need to soak these lentils. 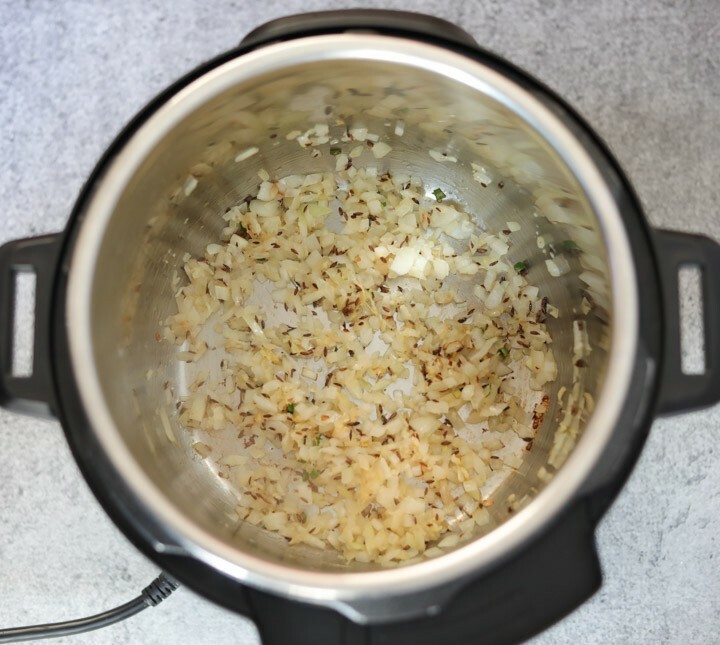 Heat the instant pot in Sauté mode and add oil to it. Then add cumin seeds, onions, ginger and garlic. Saute for about 2-3 minutes. Then add tomatoes and spices. Stir and sauté for another 2 minutes. Now we are ready to add the lentils and water. Then pressure cook for 12 minutes at high pressure. After the cooking time is done, let the pressure release naturally. If you are in a hurry, you can also release pressure manually 10 minutes after the instant pot beeps. Stir in the lime juice and garnish with cilantro. Oh…the lentils are perfectly cooked and so creamy! 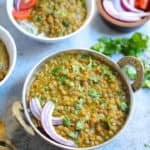 How to make Whole Masoor Dal in Stovetop Pressure Cooker? 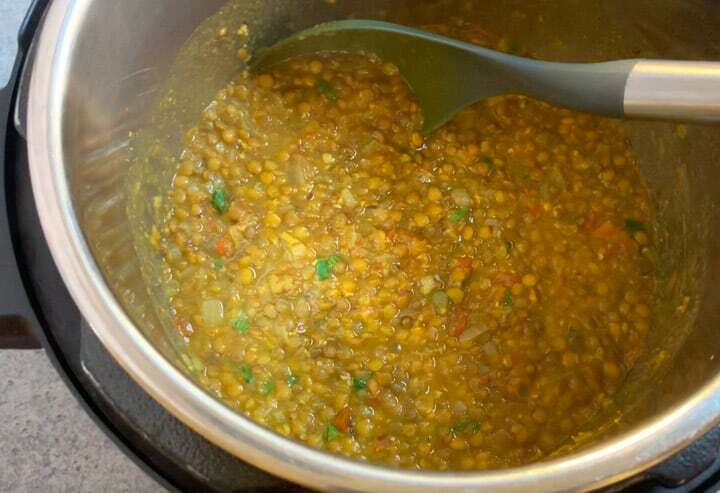 Traditionally, lentils were first boiled in a pressure cooker and then mixed with tempering (tadka) made in a fry pan. However this recipe makes Whole Masoor Dal as a one-pot recipe. Follow the same steps as above. 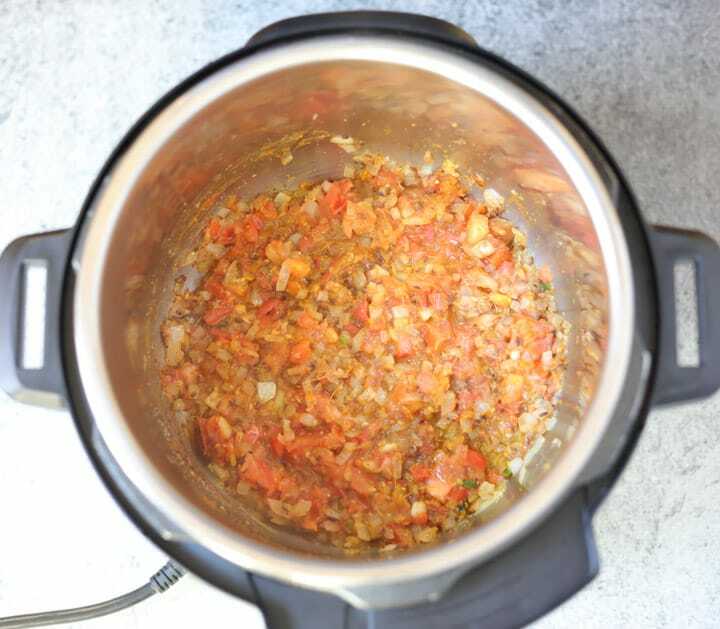 In the stovetop pressure cooker, cook for 3-4 whistles (about 12 minutes) and let the pressure release naturally. Enjoy Whole Masoor Dal with Basmati Rice, Roti/Paratha or Naan. We like to pair Masoor Dal with a vegetable stir fry along with the rice on the side. Some options for stir fry vegetables that would go well with this dal – Aloo Gobi, Bhindi Masala (Okra) or Cabbage Peas. 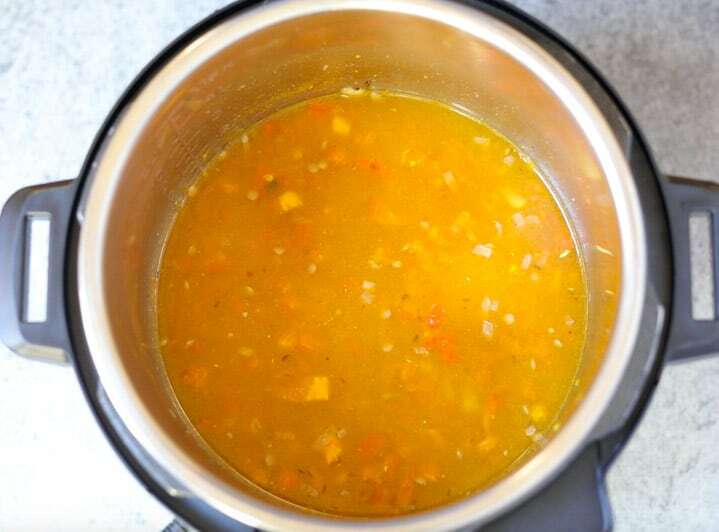 √ Uses simple ingredients that you will have in your pantry. √ Creamy and delicious, perfect to serve over rice! Start the pressure cooker in sauté mode and let it heat. Add oil and cumin seeds. Saute for 30 seconds. When the cumin seeds change color, add green chili, onions, ginger and garlic. Sauté for 3 minutes until the onions become golden brown while stirring frequently. Add tomato and spices. Stir and sauté for another 2 minutes. Add the lentils, water and stir well. Press cancel and close lid with vent in sealing position. Change the instant pot setting to manual or pressure cook mode at high pressure for 12 mins. After the instant pot beeps, let the pressure release naturally. Open the pot. Add the lime juice and stir the dal. Garnish with cilantro. Serve dal with roti, naan or rice. Follow the same steps as above. Cook for 3-4 whistles (about 12 minutes) and let the pressure release naturally. Make it less spicy: Skip the green chili and reduce red chili powder. Which Green chili to use? I typically use Thai, Birdeye or Serrano Chili Pepper in my recipes. Don't forget to adjust to your taste. Created: This recipe was created in a 6qt Instant Pot DUO60 Multi-use Programmable Pressure Cooker. Hi Suzie – Thank you so much for including my recipe in your roundup. I have pinned your post and will share it on social soon! Don’t own a pressure cooker, how long to ccook without? Hello – You can do the same steps before pressure cooking on medium-high heat in a pan. Then change to medium-low heat. Cover partly with a lid and cook for about 30 minutes or until the lentils are soft. Stir at regular intervals. Hope you enjoy it!